Some of my best photographs were totally unplanned; a nod to the adage, "it's better to be lucky than good." During today's S.W. Ohio Diagnostic Walk-About, I was photographing paper wasps and mud dauber nests under the walkway leading to the Tree House when I saw a dark blue wasp saunter into a spider web. It seemed odd; was the wasp committing insecticide? The drama was unfolding 6 - 7 ft. from my camera lens, so I couldn't see details. The true story emerged when I processed the image on my computer. The wasp wasn't becoming the spider's prey; it was the other way around. I was watching a blue mud dauber (Chalybion californicum) in action. 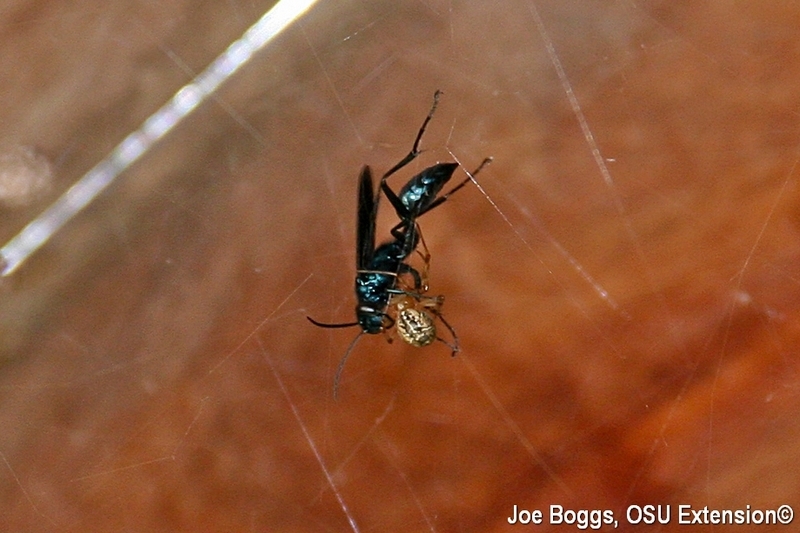 These wasps are the primary predators of widow spiders (Latrodectus spp.). Anything that can take-on a black widow and live to buzz about it is very serious predator! However, blue mud daubers are equal opportunity killers and will prey on other spiders. The dauber uses its stinger to inject venom that paralyzes its spider-prey. It's an effective way to deal with the lack of refrigeration to keep food fresh. The dauber then takes its spider-bounty to its mud nest where it lays a single egg on the spider's abdomen. The resulting wasp larva consumes the still living spider. From the wasp's perspective the spider is not lucky, but good.